Sprouted peas successfully for a school project in third grade. Helped friend plant-sit a mini jade tree for a summer (while neglecting my landlord’s plant). Poured a bucket of water onto my mother’s garden once. Clearly, I have no green thumb. My expectations for project #HNBGardenNow were low. Three months in, my chives and lemon thyme that I got from Good Eggs (<— LOVE them, by the way) are going strong, even after 5 days of neglect when I was out in Alaska. My Thai basil from the farmers market on the other hand . . . Let’s just say it’s seen better days. Much better days. I’m still working on this whole green thumb thing. This month’s theme for The Recipe Redux is fresh produce from the farmers’ market or from our gardens. Maybe when I actually have a patch of gardening area to play with, I’ll get to make a salad with my homegrown ingredients. For now, the farmers’ market will have to do. 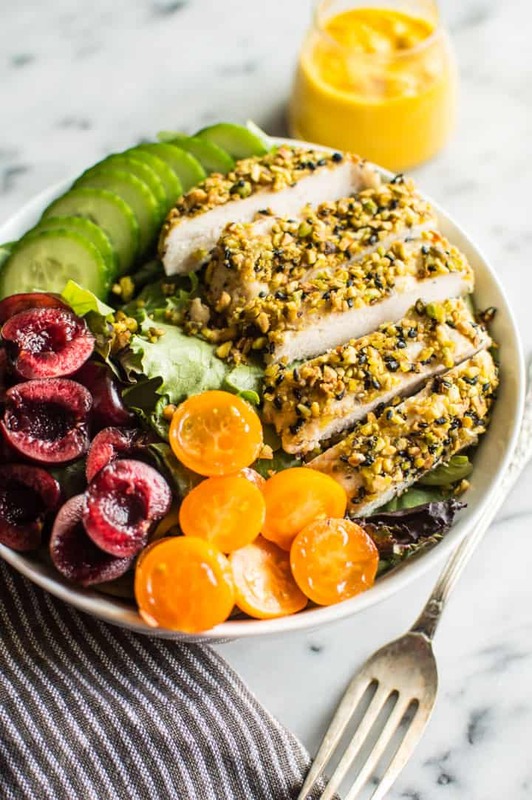 I paired some of my favorite seasonal fruits and vegetables in this salad with a pistachio-crusted chicken. I’ve been eating a ton of grilled chicken lately so I wanted to switch things up by covering the chicken in a whole lotta nuts and a sprinkling of sesame seeds. It looks like a lot of effort, but trust me, it’s simple. All you need to do is blitz some nuts and press the chicken breasts on top of the crushed nuts. Easy peasy elegant meal at your finger tips. This pistachio-crusted chicken looks fancy, but it is very easy to make! 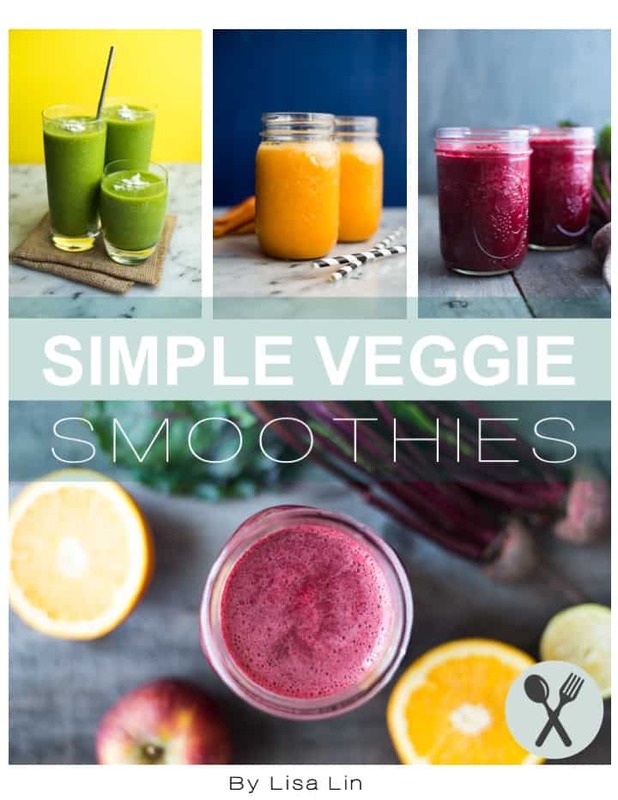 It’s great with the carrot ginger dressing and your favorite summer fruits and vegetables! Ready in 30 minutes! Serves 3 to 4. Preheat oven to 400 degrees F (205 degrees C). Line a baking sheet with a silicone mat, foil, or parchment paper. Set an iron wrack on top of the baking sheet. Pat dry the chicken breasts. Cover the chicken breasts with plastic wrap. Using a meat mallet, flatten the breasts. This helps ensure even cooking. I used 2 large chicken breasts, so I chopped each piece in half. Sprinkle some granulated garlic and salt onto each breast. Place pistachios in a food processor and blitz until you no longer see big pistachio pieces. It should look like small pistachio crumbs. Pour pistachios onto a large plate. Mix in sesame seeds. Place a piece of chicken on the pistachios and press down slightly so that the pistachios stick. Do the same for the other side and make sure to cover all sides of the chicken with the nuts and seeds. Repeat for remaining chicken pieces. Place crusted chicken on top of iron rack and bake for 18 to 20 minutes. While the chicken is baking, prepare the dressing. Place all ingredients in a high-speed blender and blitz until you get a creamy mixture. The dressing will be a little thick. Add more water if you want a thinner consistency. When the chicken has fully cooked, let it rest for 5 to 10 minutes before slicing into strips. Serve with salad greens, cherries, cucumbers, cherry tomatoes, and dressing. Refrigerate dressing for up to a week. 1. Pistachio-crusted chicken adapted from Rachael Ray. [br][br]2. If you’re not concerned about whether the dressing is paleo, you can substitute the coconut aminos with low-sodium soy sauce. Thank you for all these amazing Whole30 recipes 🙂 Looking at them, I don’t think those 30 days will be tough at all. 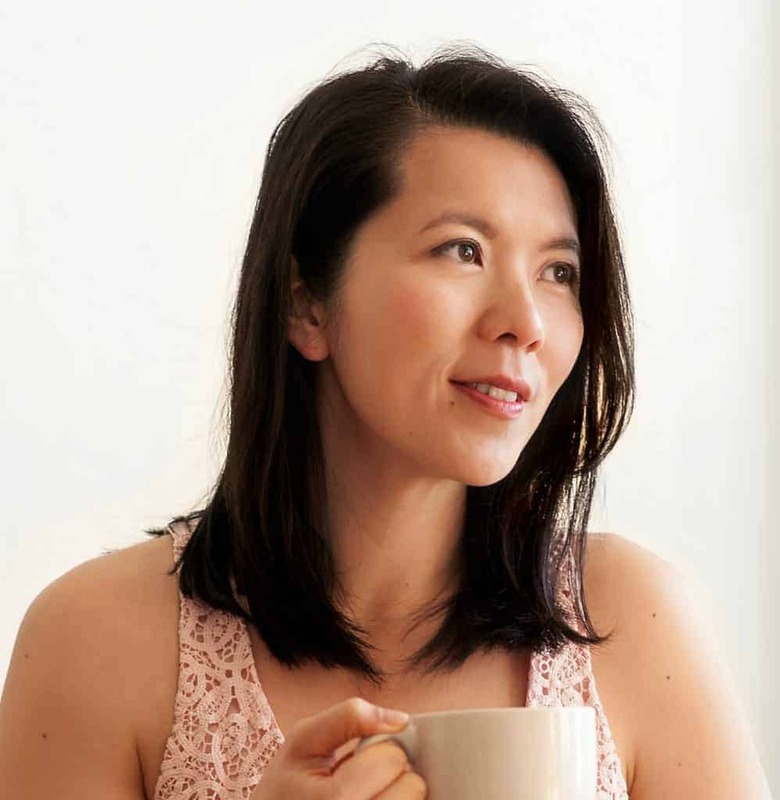 Will be sharing your recipes more as I begin mine soon! 30 days will fly by before you know it!! Yea, I just get tired of eating grilled chicken in my salads all the time. Thanks, Dixya! What did you grow?? I think when I have my own garden, I want to grow swiss chard like my mom does. I have a loooong way to go though! What a colorful salad! Not only is it gorgeous, the flavor combinations sound amazing- I can’t wait to give this salad a shot! Thanks, Katy! Let me know if you try it! This is amazing! Where do I even start? Pistachios are one of my favorite nuts to crust chicken with and then you went and added sesame seeds! Brilliant! And the cherries….and the dressing….all of those flavors at once. Drooling! This chicken is gorgeous (if chicken can be gorgeous, haha) that pistachio crust is calling my name! Haha, yes, I think chicken can be gorgeous! Thanks, Gina! What a gorgeous salad! And that dressing sounds divine! This looks absolutely perfect! <3 Pinning to hopefully try soon–it sounds so good! You’ve been growing your own herbs!? Girl that is awesome, kudos! That is definitley on my to-do list..or even something small like cherry tomatoes or something..it’s in the works and you are def inspiring me! Thanks, Selena! Well, I’m trying to grow my own herbs and I have about a 2/3 success rate, so that can use some improvement. This looks like such a satisfying meal! I love the crust on the chicken, it looks delicous. This is gorgeous, Lisa! I haven’t tried coating chicken in pistachios before so I’m excited to try it! Thanks, Karman! I usually use almonds, so the pistachios were a fun change for me! I love the idea of the pistachio crust! and my thumb is totally army green–some of my herbs are…okay. Most of our flowers and trees are doing pretty well, though! So, I call that a victory even if I murdered a cilantro, basil, and lemon thyme plant. Such a lovely healthy crust on the chicken – love the flavours. I feel healthy just looking at this salad! 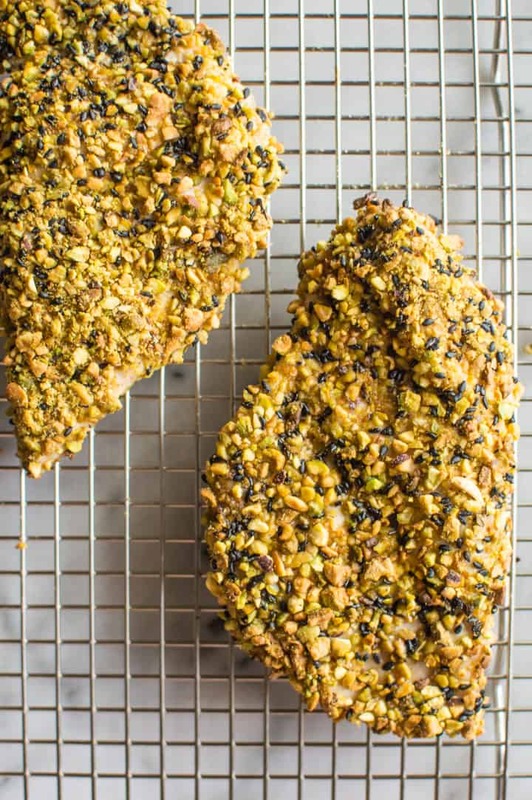 Love the pistachio crust on the chicken – I bet it taste amazing! Thank you so much, J!! He should share his gardening tips! That dressing, those colors! Positively gorgeous, pass me a big jug of that Carrot Ginger Dressing! This sounds fabulous. and those pictures! amazing! What a gorgeous recipe! I love how healthy it is, too. The coating for that chicken looks amazing! I can’t wait to try it. My Dad can’t eat gluten so anything that means we can all eat the same when he comes to visit is a plus for me. Thank you so much, Claire! Let me know if you try it! 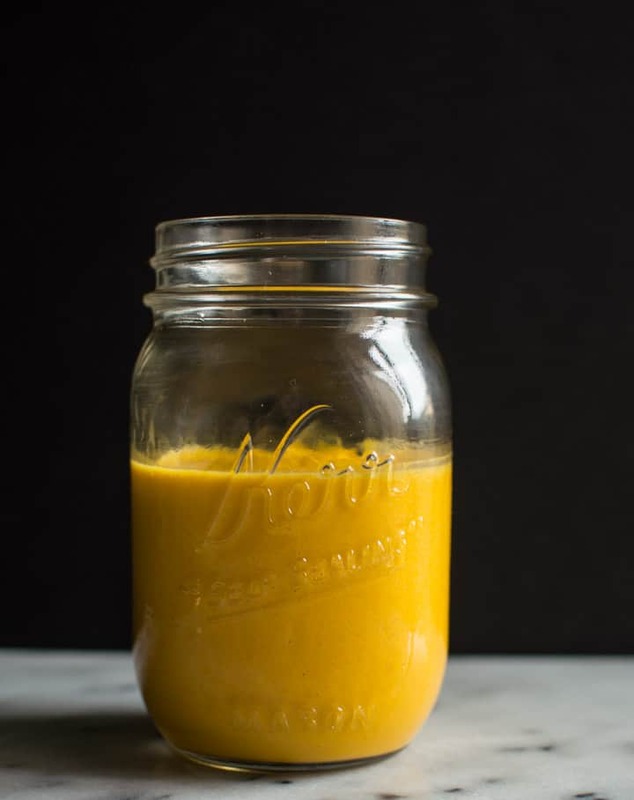 I love that the carrot ginger dressing is so nutritious and it sounds like the flavors are amazing! Very creative and deliciously looking meal! Gorgeous pictures, Lisa! Pinning! I love everything about this salad! 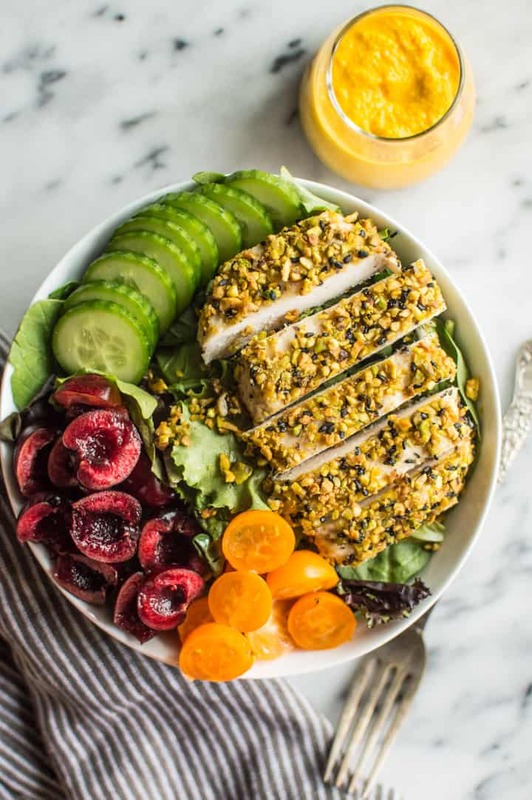 The pistachio crust and carrot ginger dressing looks incredible. I love the addition of fresh cherries too! I don’t have a green thumb either but I really do love growing fresh herbs in my herb garden. It makes it so easy to add flavor to my favorite meals. Yes, I love my chive plant because I never finish the bundle that I get from the farmers market in time! Ok first of all that chicken looks ah-ma-zing! Can’t wait to try it!! Hahaha, yes, I’m not a Martha, and I’m proud of it! 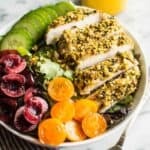 Lisa, this salad is gorgeousness x 1,000. . the pistachio crusted chicken and the carrot-ginger-dressing!!! I die!!! LOVE this so much! #pistachios are my secret love! Must try asap! Thanks for sharing. Hey, two out of three herb successes isn’t bad!! I’m sure thai basil is hard because you never ever see it in stores! Love the vibrant colors in this salad. Almost too pretty to eat! Great recipe! I love walnut crusted chicken, though I haven’t made it with pistachios yet. Will have to make this very soon! Thank you so much, Marissa! Let me know if you do!